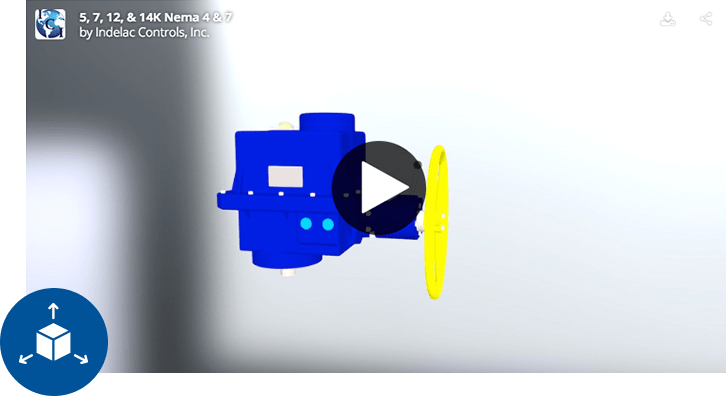 K Series | Indelac Controls, Inc. This series of heavy-duty reversing actuators were developed in 1995 and went into production early in 1996. 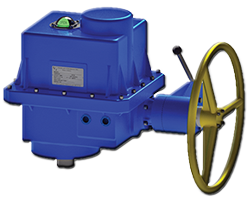 ICI‘s K series rotary electric actuator is a machine that was designed to automate quarter turn equipment requiring up to 27300 lb × in (2275 lb × ft) torque. The K series actuators are equipped with a combination spur gear-worm/worm gear drive train providing efficient and quiet operation, resistance to back driving and long maintenance free service. The heavy-duty sand-cast aluminum enclosure meets NEMA 4 specifications and is equipped with a thermally bonded ultraviolet resistant polyester powder coating that not only enhances its appearance but is also a tough corrosion resistant coating. Standard equipment includes 115Vac-1ph continuous duty motor with thermal overload protection, heavy duty hardened steel spur/worm with bronze worm gear, electronic torque sensor, two limit switches wired for light indication, stainless steel fasteners, 300 series stainless steel output drive, declutching manual override with hand wheel, visual position indicator and polyester powder coating. 12Vdc, 24Vdc, 24Vac (24Vdc rectified) 230Vac-50/60 Hz-1 Ph. with thermal overload protection. 230 or 460Vac-50/60 Hz-3 Ph. with thermal overload protection. Sand-cast aluminum with 300 series stainless steel fasteners and thermally bonded polyester powder coating. Output Drive: Male with double D shaft, ISO 5211 F14 optional. 300 series stainless steel. AVAILABLE OPTIONS: Maximum of 4 auxiliary switches, power off brake, feedback potentiometer, 4-20mA positioner (equipped with 24vdc power supply for transmitter), 4-20mA position transmitter (requires 24Vdc power supply), compartment heater, heater and thermostat, breather, three position control, light indication, two wire control, timer, speed control, remote/off/local control panel, electronic torque sensor and one additional ¾” NPT conduit entry.